Social networking sites are often used to discuss social and cultural issues, and a substantial majority of social media users – white, black and Hispanic – report they encounter content on these platforms about race or race relations. But the amount of race-related content users report seeing on social media varies considerably across racial and ethnic groups, with blacks being especially likely to see content that pertains to race on these platforms. In general, Americans are much more likely to see posts related to race or race relations than they are to personally post or share race-related content. Even so, roughly four-in-ten social media users indicate that at least a few of the posts they share are related to racial issues. 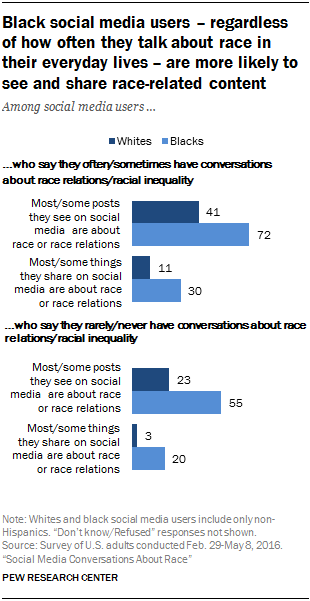 And just as black social media users are more likely than whites to come across posts about race on social media, they are also more likely to personally share or post race-related content. Fully 68% of black social media users say that at least some the posts they see on social networking sites are about race or race relations, including 24% who say this describes most of the content they see on social media. Whites are significantly less likely to encounter race-related content on social networking sites. Among whites who use social media, roughly a third say most (6%) or some (29%) of the content they see on social media is about race or relations. An additional 48% say only a few of the posts they see are about race or race relations, and 16% say none of what they see relates to these topics. Hispanics fall between these two groups: 54% say that at least some of the posts they see are about race or race relations, while 44% report seeing only a few or no posts on the topic. Overall, four-in-ten social media users indicate that at least a few of the posts they personally share on social media are about race or race relations. A relatively small share of social media users, however, say that most (2%) or some (11%) of the things they post are race-related. 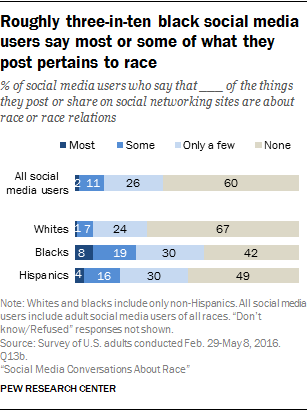 Indeed, a majority of social media users – 60% – report that none of their social media postings pertain to race. Among Hispanic social media users, one-in-five say most or some of their social media posts are about race or race relations. In contrast, only 8% of white social media users say that at least some of things they share or post are about race or relations. In fact, a majority of white users (67%) say they never post or share things about race, while an additional 24% say race is the focus of only a few of their own posts. 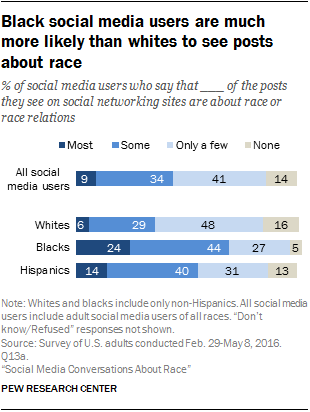 It is worth noting that significant shares of black and Hispanic social media users also report that many of their own posts do not pertain to race: 42% of black social media users and 49% of Hispanic social media users say that none of what they share or post on social networking sites is about race or race relations. People can have conversations about race-relations both online and offline, and social media users who discuss race relations or racial inequality more frequently overall are also more likely to see and share posts about race on social media. But regardless of how much or how little they talk about race in their everyday lives, race-related content remains a more common component of the social media experience for black rather than white users. And even among black social media users who say they rarely or never discuss race relations or racial inequality, a majority (55%) state that most or some of the posts they see on social media pertain to race or race relations. That share drops to 23% for their white counterparts. These racial gaps also exist for how much users themselves post about racial issues. Some 11% of white users who have regular conversations about racial inequality or race relations also report that most or some of their social media posts are about race; for black users that share is higher, at 30%. And while 20% of blacks social media users who report rarely or never discussing race relations say that at least some of things they post or share on social media are about race or race relations, few white users – 3% – who discuss race infrequently say the same.